I think there are several aspects to creating the feel of a natural environment on Mars, even before we have full terraformation. Do it right and it will greatly enhance the experience of being on Mars and be a powerful attractant for permanent settlers. 1. Create a big space. The current record for dome construction on Earth is over 300 metres...that's a big space. You wouldn't necessarily need to go to that extent to create interesting vistas on Mars. Mixed in with real shrubs and trees, these would not be distinguishable from the other flora. You could use the sort of effects developed by film sets to create the feel of greater distance than is actually there. 3. The supported arched spaces could run indefinitely. But obviously there would be practical limits. We wouldn't want the arched spaces, which would be pressurised, to be too large as that creates a risk of major catastrophe. 5. The roof could be glass with a blue and white coloured gas to simulate a spring/summery Earth sky. The passage of the sun could be enhance with artificial light. 6. Maybe the arched space would average about 200 metres across. Down the middle would run cycle paths and footpaths over natural-feeling trail ground (mud, gravel, tree bark etc). 7. There should be mechanisms to create gentle breezes. 8. The arched spaces would be connected by tunnels with triple air lock doors that open and close in sequence. 9. The Mars community could gradually build up the number of arched spaces connected by tunnels. So this could be a long term project over several decades until you have a trail system that runs for hundreds of miles through maybe 40 interconnected arched spaces. 10. The arched spaces could also be linked into pressurised gorges (either natural or of artificial construction) and tubeways to more distant locations. As an experimental ecological facility it allowed the study and manipulation of a mini biospheric system without harming Earth's biosphere. Its seven biome areas were a 1,900-square-meter (20,000 sq ft) rainforest, an 850-square-meter (9,100 sq ft) ocean with a coral reef, a 450-square-meter (4,800 sq ft) mangrove wetlands, a 1,300-square-metre (14,000 sq ft) savannah grassland, a 1,400-square-meter (15,000 sq ft) fog desert, and two anthropogenic biomes: a 2,500-square-meter (27,000 sq ft) agricultural system and a human habitat with living spaces, laboratories and workshops. Many of the aspects of mars dome use we will need solved for the same issues as we had on Earth. Yes I am sure we have learnt a lot from the Biosphere project which can be deployed on Mars. One lesson is that you don't have to have a 100% closed system. That just creates unnecessary challenges. Also, I think for what I am describing you would probably have a much narrower range of flora and fauna - a kind of basic temperate-mediterranean eco system. I think that would make it much easier to manage. I will continue to be different. First of all I still request that someone demonstrate that they have evidence of a dome or greenhouse that has been pressurized to even 70 mb above ambient for several years. Really they should demonstrate at least 333 mb above ambient for several years. Other than that, I have offered an method to build large structures under ice. Of course you must then use artificial lighting. You must for that have an electrical power grid. Copper, Aluminum, or fuel and O2 pipelines with fuel cells. None of this is easy. But one thing about apple orchards is that they can endure a winter season. So, if they need 90-100 days of warmth and sunshine, then how long can they endure a winter? The point being that you could have many such gardens carved into the ice deposits of Mars, and perhaps only warm each one up maybe 25% of the time? That being a method to maintain the integrity of the ice. But if an apple orchard in winter, still a place to walk in. And yet perhaps another one which is in spring bloom, and yet another one mid summer, and yet another one, for harvest. As for the type of lighting, just what is needed for the trees, and the other plants, unless a human appears. Then full simulation as is possible of daylight. Not the only method. A potential method. That is carved/melted vaults under the ice which are supported by a re-frozen lining of fiber-ice, and inside of that another wall of artificial materials we may be more familiar with. So, if we can calculate the thermal inertia correctly, then we only have a summer for the apple orchards that is warm enough and long enough for them to do their warm season life functions. 90-100 days? 60-80 degrees F? Not sure. The intention is to not melt the fiber ice supports. Then a winter as long and as cold as the apple trees can tolerate. But no reason to not have gardens between the trees. As I have said a method. Not the only method to consider or use. Void, I think you are perfectly right about fibre/ ice structural material and insulation lined caverns. I think these will be just the thing on Ganymede or Calypso. I'm not so sure about Mars as the conditions are not so cold. I would foresee the structure creeping as does a glacier. Ice structures on Mars might be useful as a cheap method of storage for food, vehciles and spare parts, to protect them from dust and solar radiation. Elderflower and Louis. I note your points/concerns. I myself am not totally sold on it. I would want to know more about the reality of the situation before committing. However I am going to argue a generally positive case, while when needed also to note concerns. First of all, I want a water supply which can be throttled to needs. Water will be consumed to make fuel, and to make resins and plastics, ect. Some water will leak out of processes and will need to be "Made up". When I worked in the mines this was called "Make-up water", so I stick with what is comfortable to me. Empires always need a good water supply. The Roman Empire worked hard on such, including aqueducts. While I hear about "Mining" ice on Mars, I have a preference not to strip mine ice, but to melt or evaporate it from below. Thus potentially creating enclosed spaces. The question is what is going to be the quality of those enclosed spaces, and what could they be used for. On the optimistic side lets have a look at "Camp Century". So, what are the potential problems? -Voids in the ice may perforate to the tunnel and decompress it. -Mars quakes could crack and depressurize the structures. What are the favorable factors??? -Mars Gravity .38 g, so less of a tendency to sag. -A water supply, and expanding volume of enclosure, possibly pressurized. Perhaps weaving techniques could be utilized to make the frozen mixture of mineral wool and water less inclined to sag. I also do specify an arch shape which should help. Unlike in the arch tunnel pictured above, I would intend the tunnel bottom to be regolith, not ice. How to keep the tunnel sufficiently cold, if you are going to have industrial and gardening processes in it? One way would be to have many tunnels that are only radiators. That is the cold air inside them to be circulated into a section of tunnel which does have a further enclosing device for a factory or garden. The air transfer tubes should have valves/dampers which will shut if the air pressure drops in these radiator tunnels. Another way would be to have piping with a cold fluid such as Ammonia which first goes into these tunnels and picks up their heat. Then the flow would go into a water canal to warm up more. Then through a (Turbine maybe), and then to a radiator on the surface. Or, another way would be to use a heat pump to pump heat out of the tunnels, and into a water canal. Then as desired, dump heat to the Martian sky to generate power. 2) Vast volumes of enclosed space. The question being can you make that enclosed space useful, even to the point of having a garden in it? I think the answer could be conditionally yes. But I am not certain. I think experimentation on the ground will be required, as the Martian Utopia Planetia environment underground is not identical to that of the Greenland ice cap. It may only be similar, and require it's own new tricks, if it can be used at all. A BBC nature documentary has inspired the search for life deep beneath Antarctica’s glaciers. Although no living things have yet been found, DNA of them has, increasing the possibility that life has found a way. Dr Ceridwen Fraser of the Australian National University watched a “frozen planet” documentary featuring the ice caves of Mount Erebus. Along with other Antarctic volcanoes, Erebus releases steam that hollows out enormous interlocking cave systems deep under the ice. 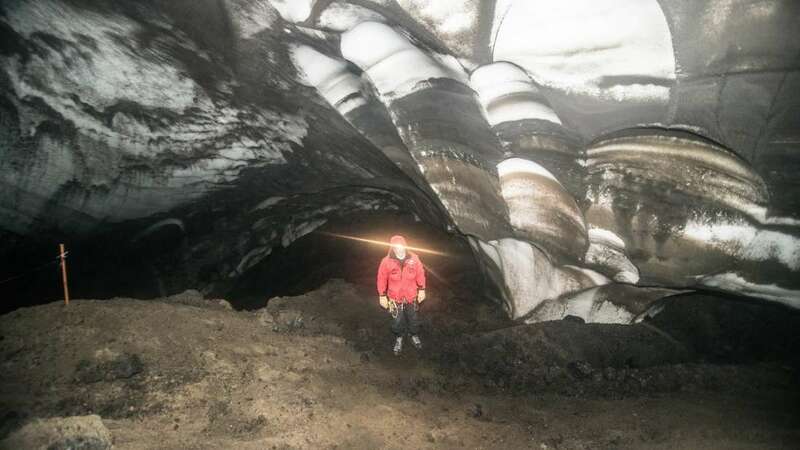 Fraser has been trying to establish whether volcanoes enabled life to survive ice ages in Antarctica, and saw an opportunity to explore their role today. She discovered that some biologists specializing in bacteria and fungi had organized for samples of regolith from the cave floors to be brought back for analysis. When she looked more broadly, most of the DNA she found came from plants or animals. This doesn't mean the caves currently host life, Fraser stressed in Polar Biology. Her discoveries could be legacies from long-gone ecosystems or dead material that blew in from elsewhere. The ice caves’ sizes are unknown, but it is thought that vast networks of interlocking chambers exist in several locations. Moreover, Fraser told IFLScience that the magma chambers of some Antarctic volcanoes are so large, they stay hot for hundreds of thousands of years. This means the caves may last long enough for complex ecosystems to evolve, even at the, shall we say glacial, pace at which Antarctic life tends to move. The interconnections could also enable lifeforms to move from one cave to another, outlasting any specific location. Besides shedding light on Fraser's work on survival during ice ages, anything we learn may have implications for life in colder parts of the Solar System. So, I think the jury is still out on this notion. Not the water supply, I think that that method will be good. But if the resulting enclosed spaces can be used for much value. Having said all that, I request that someone tell me if anyone has ever pressurized a dome/greenhouse significantly for a long duration of time? I start with a generally positive view of ice structures. We know that on Earth, at least in the recent past, people have lived in sealed (if not pressurised) ice structures. Ice has a lot of potential benefits e.g. blocking harmful radiation but potentially letting through some light. We know it can be formed into all sorts of shapes. So, yes, we definitely need to look into such structures but equally they do carry risk on Mars and so are probably not a first choice for safe human habitation. Also, the point of this thread was creating large pressurised spaces that give you the illusion of being in a natural landscape on Mars. Ice, in my view, is definitely not suited to that in my view. I am sorry you are disappointed. I will try harder. Suppose your vault has 200 feet of ice and rock above it. Suppose it does indeed represent a safe way to hold a significantly pressurized mix of N2 and O2, with some Argon perhaps. Then suppose that it is partially a by product of having a water source. Further suppose that it may expose useful minerals. To mine. So, a water source, and air tank, and a possible access to a desired mineral. Then also Utopia Planetia's deposits are from 15% to 50% regolith. If it is all dirt, I will be disappointed. Maybe there is stone however. So you can build stone walls inside your vault. At those temperatures even dare to use something like tar to cement them together. Or use Inca methods if you can figure them out. So, inside of a "Vault" that just might be as high as 300 feet, and overburdened by 200 feet of materials, you can make stone walls. Can you then make tents or inflatable domes over the walls? If the Vault is air tight stable then you don't need exotic materials. And your tents and inflatable domes don't have to hold differential air pressures. The floor of your Vault is to be regolith. Why don't you dig a swimming pool/pond? Artificial lights required. How often will you have a swimming party? Well, when you are not having a swimming party, why not grow duck weed in it? Schedule a swimming party on weekends? Harvest much or most of the duck weed before that? Tuck it away for a while during the swimming party? I think something like that might have psychological value. And it is also a farm. No reason not to have some ornamental plants in this enclosure. Pond plants, maybe some bushes with some kind of berry? So this is a sub-tropical micro-environment. What if outside of it you had something cooler. A dome over your pond dome. Then maybe some useful flowering plants. Maybe even crops. Not necessarily wrong. You won't heat it specially. The heat that leaks from the pond dome will help heat it. That and the pink lights. Maybe normal lights if humans are in there to enjoy it. But pink grow lights otherwise. What if outside of that was a forest of temperate short growing season trees? Maybe a stone cottage. (Roof made of Mineral wool tar paper and Carbon joists? Maybe instead of enclosing this in yet another dome, have a dome on wheels. It can be "Carted" over the forest when you want it to have a summer. Otherwise, when you want that forest to have a winter, you drive it to another forest inside the Vault. There would be several fruit tree forests, staggered with each other for seasons. Quite often blooms, and quite often fruit. Although I will love being told that glass domes and glass greenhouses can indeed be quite pressurized, and that that has been tested for several years, I have yet to have this confirmed. Do you have such a very desirable piece of information? Well we've had craft with observation windows go to ocean depths where the pressure is over 1 million Mbars, compared to a differential on Mars one thousandth less, about 994 Mbars (though it could be lower). I think that puts the pressure issue in perspective. That's a good answer. But of course we are talking about compressive pressure in that case. What about dealing with required tensile strength in the case of the concept of a multifaceted dome or greenhouse. I'm not calling you out to be a jerk. I just don't see it working effectively for a reasonable price. However, I do have notions of my own as how to turn a dome upside down, with berm buttressed walls, to make the pressure contained within more contained by a compressive method. Still I consider it to be a vast struggle. Not that the struggle should be abandoned. Rather I think it is going to be a real challenge. I just don't like the word dome or greenhouse bandied about as if saying it represents a technological solution which can be trusted in the longer term. Years. But maybe I am going to get educated. If so, then thanks, may I have another. I want success. I am not here to play Satan in your contemplation of heaven. And I do wish all the success against my concerns that you can possibly muster. I do have another use for ice caves. Skating and Hockey. Not actually my joy, but if one is on Mars looking for open physical activities which would contrast with living in a tin can, I guess I would adapt. Quite a few other people would like it. So, in sections of Utopia Planetia where the regolith content is high, a ice cave carved for water could have regolith piled up against the ice walls as part of the insulation. And inside of a basin formed a water pool with ice over it. If the pool contained salty water, it might be possible to have a thermal stratification under the ice. The upper water would be less salty but colder than 0 DegC. The lower bottom water could be as warm as 20 DegC. While it might be possible to shine light through the ice to promote photosynthesis, I really prefer to conduct Chemosynthesis in one or two layers of water. CO2, CO, O2, Methane, Nitrogen and other substances to promote microbes which will manufacture biologically useful outputs, such as fuels, and maybe foods. In the 20 DegC bottom waters, perhaps enclosures, either largely water filled or air filled, to promote the growth of vascular crops under artificial lights. So, this ice cave would earn it's keep, but the ice above would be for human recreation. Again also it would not be wrong to have "Warming Houses" with plants in them to promote a happy psychology for humans on Mars.